Bring out hair’s natural beauty and texture as your nourish it. Avena Strigosa Seed Extract (black oat), blended with Coconut Oil and Extract, moisturizes and helps repair damaged hair. Yucca Cactus and Aloe add volume and shine. Oleic acid-rich safflower oil and Panthenol quickly penetrate and smooth, without weighing hair down. distribute evenly. Style as usual. Ingredients: Water (Aqua), Cetearyl Alcohol (Coconut Oil), Behentrimonium Methosulfate, Glycerin (Plant), Avena Strigosa Seed Extract (Black Oat), Hydrolyzed Soy Protein, Hydrolyzed Rice Protein, Cocos Nucifera (Coconut) Extract, Panthenol (Provitamin B5), Agave Rigida (Sisal) Extract, Aloe Barbadensis Leaf Juice, Yucca Schidigera Root Extract (Yucca Cactus), Carthamus Tinctorius (Safflower) Seed Oil, Cocos Nucifera (Coconut) Oil, Hydroxyethylcellulose, Symphytum Officinale Leaf Extract (Comfrey), Tocopheryl Acetate (Vitamin E Acetate), Cetyl Alcohol, Glyceryl Stearate SE, Glyceryl Caprylate, Lecithin (Soybeans), Sodium Hydroxide, Sodium Benzoate, Fragrance (Parfum), Citric Acid. Really happy with this product. Smooths my frizzy hair in the summer humidity. I agree with the other reviewers that a little goes a long way. Only complaint is that the scent is a little strong when you put it on, though not offensive or completely overpowering. This is a nice product. It's quite thick and if you use too much can make your hair feel oily, but for the most part it works pretty well. This stuff makes my hair pretty soft, and smells nice. A little goes a long way. 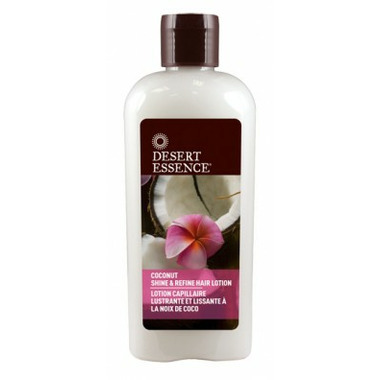 It smells fantastic, it makes my hair smooth and shiny without adding any weight to my hair. It is very well priced also, it is now one of my regular product in my hair routine! Smells great and works pretty well on my thick and very frizzy hair. It doesn't smooth it or make it as shiny as I would like, but still pretty great for the price! It works pretty well for smoothing when I wear it pulled back too. Love this stuff. Great smell, efficient, makes my hair look nice. I have curly hair that is really frizzy without product. I just put some in the tips and blow dry with a diffuser with hair upside down without brushing _ great results. I've tryed a lot of similar products. I really love this one in my curly hair. I put a small amount in my hair and let dry naturally. Smell nice and not too strong and heavy in my hair. But I already like coconut smell. Nice products and natural so i give 4 I 'll probably buy again. Je n'ai pas beaucoup aimÃ© ce produit , il n'a rien fait a mes cheveux de plus l'odeur est vraiment trÃ¨s forte . Results are exceptional on my hairs. I recommend it to everyone.